This morning started in the usual way, sound of children’s voices, morning prayers, changing diapers, etc. But today was different. On Sunday my friend Marilyn and I made plans for a Moms Day out. There are several Mom’s night outs (about 2 a month), but we seem to have trouble getting to these. So, she asked if I wanted to go out during the day. Well, do I? I was so ready for a break! I drove to her house, about 35 minutes away. Before I left my driveway, I saw a few children at the door. MaryEllen was all red and crying, “I don’t want you to leave!” she yelled. Kevin was standing there holding Charlotte. They were both waving until Charlotte realized I was leaving and she started crying too. I was so sad, but funny at the same time. Marilyn did the rest of the driving. We started out at JoAnn’s Fabric in Cool Springs, TN. That might possibly be the largest one, certainly the largest one I have ever seen. She helped me pick out fabric for some maternity clothes. (I am having a horrible time finding some that are decent!) They, along with WalMart were out of maternity panels. Actually the only reason why we went to WalMart was to look for those panels and the lady said they haven’t carried them in 6 or 7 years. Next was lunch. We went to this quaint little Italian resturant in Nashville, somewhere, out of the way. We had a lovely little lunch. After lunch we went to Wild Oats market and then to Costco. We ran into Fr. B. in Costco and then I saw a girl who used to work in the Winchester, VA Costco. Next we didn’t know what to do with ourselves with out children so we decided on a book store. It was great because I got to show Marilyn a bunch of children’s books that we have really enjoyed. Then it was back home before the rush hour. When I got back home a bunch of children came out to hug me and tell me how happy they were that I was home! Ahhh, motherhood. What a blessing. This evening after the children went to bed I swept and washed the kitchen, mudroom, school room, and laundry room floors. Tomorrow will be the den floors and vacuuming 2 of the bedrooms. A midwife whom we have never met is coming over and I don’ t want first impressions to be that we are slobs! However, she has 4 small children of her own, so I suppose she is used to it somewhat. There are also some pictures on my camera from 2 Sundays ago that I want to post. Hopefully tomorrow I’ll get Joe to get them downloaded for me. He’s in bed already tonight. So, stay tuned! 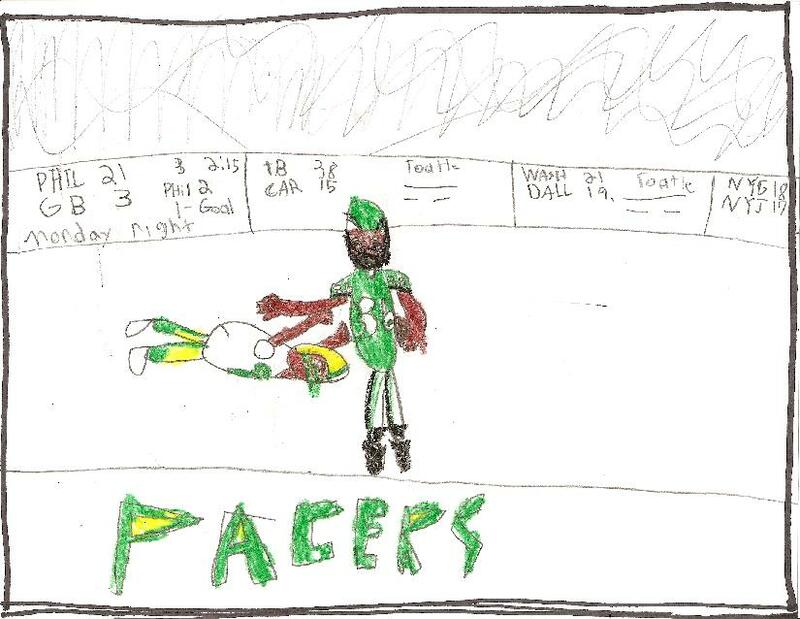 Next we have a football picture drawn by John…. Last we have a football picture drawn by Kevin. The Titians are his favorite team. He said this was the game when they knocked Donovan McNabb out of the game. Our schooling has grown a bit mundane lately. Before Christmas we had started the first unit of Connecting with History, Vol. 1. The boys enjoyed reading the Bible (as they usually do) and Science in Ancient Mesopotamia. We stopped for the holidays. Now we are back in full swing and started working on Unit 2 yesterday. We were reading about Abraham. One of the recommended resources is Old Testament Days. In it are projects that have to do with the life and times of Abraham. This coming week we will be working on sleeping mats, making clothing, jewelry, and even food from that time period. Although the book is recommended for the younger grades, my eldest (5th grade) is really looking forward to it all. After our day in Abraham’s time we will reinforce things and move onto some projects in the book Ancient Egyptians and Their Neighbors. In the section of this book that we’ll be working on concentrates on the Mesopotamians. We will (hopefully) be making a house model and a cone mosaic out of styrofoam and gold tees, a clay cylinder seal, and working on a hanging loom. We also hope to make some model ziggurats. The children and I are really looking forward to these projects and reading more about this time period in history. I’ll have my camera handy! There was a time when I was the mother of 3 boys. It was really fun, but when I had MaryEllen it took some getting used to. Her Godmother was the first to get her a doll. When I was in labor with Charlotte, the midwife’s assistant asked me if I had any pony tail holders for MaryEllen. To be honest, the thought of these girly things never occured to me. Charlotte however is in luck! She learns plenty from her big sister. When MaryEllen is getting her hair brushed, Charlotte will try and push her out of the way to get hers brushed instead. If MaryEllen wants ponytails, guess who else wants them now? The other day I snapped these shots. It was the first time I put Charlotte’s hair in ponytails. She promply took one out, but then gave me the ponytail hoder and wanted it back in. We stopped in the Goodwill store today. I was looking for maternity clothes. Didn’t find any, but on the way in we saw this lovely, sturdy little rocking chair. When I asked how much the guy looked at it and said, “$12.99. “Sold!” I replyed. On Thursday of this week we went down to Hanceville, AL to the Shrine of the Most Blessed Sacrament. Unfortunately I forgot my camera! Darn! On the way home while stopped for gas, James announced that he lost his tooth. Here is a picture that I took today. I did not get the pictures that I would have liked to, but here are some. We celebrated Epiphany on the evening of January 6 at the home of our good friends, Mr. & Mrs. Gabbett. Everyone loves to go there for anything, but a party was a little extra special. First we had a Christmas present for them. (Perhaps we should call it a ‘Little Christmas’ present). It was a pitcher for thier kitchen. Second, the chess games began. All the boys (young and older) love chess. The girls got dinner ready, played with lots of neat toys, and read books. We had a wonderful dinner with Turkey vulture meatballs, “cream” of broccoli soup (AKA Fr. Pokorsky’s favorite soup), and bread. For desert there was a King’s cake (see birthday recipes.) The jewels were non-dairy grain sweetened chocolate chips and the children’s favorite candy from the health food store known around here as shotgun bullets. After dinner, while Dad and Mr. Gabbett played a very long chess game (that ended in a tie! ), most of the children and the ladies made crowns. Mr. Gabbett had gotten crowns from Burger King that morning and had put a little Christmas tree over the BK symbol. I brought Catholic stickers of all kinds and Mrs. Gabbett had gotten glitter glue and chirstian foam stickers. Everyone, except James who didn’t want to make one, had a wonderful time decorating the crowns. After the crowns were done, Mr. Gabbett blessed the house with blessed chalk. I wish there was a picture of that! The next day was Sunday. We went to Mass and when we came home Dad blessed our home with the blessed chalk and then we found out we are expecting!!! Today is also the Anniversary of my husband’s uncle Bill Vogel’s death. Uncle Bill was a Lt. Colonel in the US Air Force. He must be a saint because he had two children whom we love dearly and one of them is a priest! Uncle Bill is on the right. This was taken during WWII. This is Lucy and her husband George, and their dogs Muffin & Doogie. It was taken in 1992. 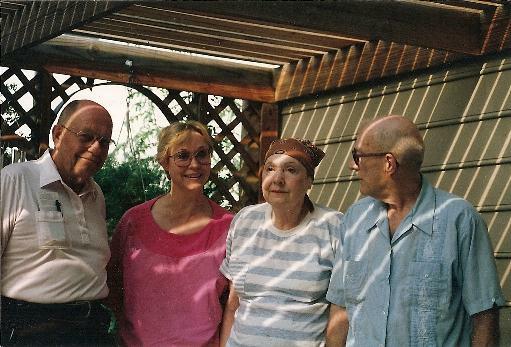 This is a picture of my husband’s Uncle Bill, sister Lucy, mother, and father. It was taken in 1991. We just found out yesterday (although perhaps we had some clue last week at the Grand Ole Opry when I started bawling and sobbing at one of the songs!). It is so early that I hesitate to mention it here, but I have a feeling that it is going to be part of my blog stories. This baby is due around September 12. What do the children think? What were the children arguing about today? Who gets to sit next to the new baby in the car. Perhaps this gives a little glimpse of what the next 9 months are going to sound like. Oh brother.